Articulate Storyline lets you embed interactive SWF files, also known as Flash files, to extend the functionality of your e-learning content. If your SWF file is a movie that requires no interaction from learners, insert it as a video. This synchronizes the video with the slide's timeline. If your SWF file contains interactive elements, use the method described below. This plays your SWF file independently of the slide. To add a Flash file, go to the Insert tab on the ribbon and click Flash. Then browse to your SWF file and click Open. 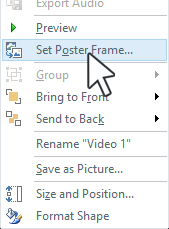 Tip: If your SWF placeholder is hard to see (it could appear as a white, black, or transparent rectangle in Storyline), you can right-click it, select Set Poster Frame, then browse for an image file to use as a placeholder. To adjust the properties of an embedded SWF file, click once on its placeholder, then click the Options tab on the ribbon. The options for interactive SWF files are the same as those for videos. For details, see Adjusting Video Properties.